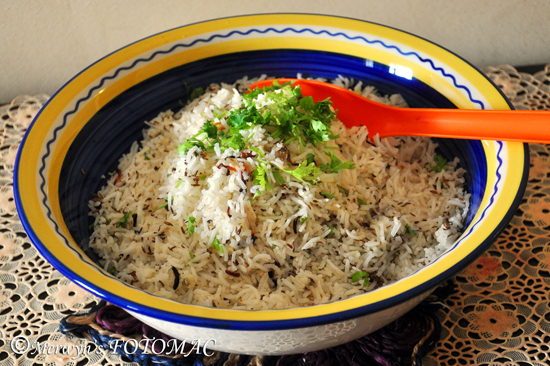 This is a simple preparation of rice which is flavored with shahijeera which is very aromatic. Jeera fried rice is versatile & is easily enjoyed accompanied with any dal or vegetable preparation. It goes exceptionally well with chicken, mutton, egg & fish gravies too. It tastes great with plain curds & pickle & can be used to prepare any biryani as well. Pick the rice & wash it about 2-3 times till the water runs clear. Drain & let soak for about 20 mins. Cook the rice in a sufficiently large pot of boiling & salted water till 3/4th done. Drain completely & let it cool completely. Heat a sufficiently large & deep wok/kadhai/dekchi/pot with oil & ghee till hot. Add peppercorns, bay leaf, cinnamon stick, cloves & shahijeera, black & green cardamoms & let it splutter. Then add onions, a little salt & pinch of sugar & fry the onions till a light golden brown. Keep a few fried onions aside for garnishing. Add the cooled rice & toss till well mixed. Take care that the grains of rice do not break. Adjust salt to taste. Toss the rice till it gets a fried & glossy look. Serve hot garnished with reserved fried onions & chopped fresh coriander.